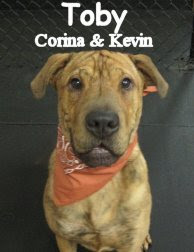 Kyoshi is a brindle Akita who is about one year old. His owners describe him as "very playful and energetic," and I have to agree! Kyoshi loves to tear it up here at the Fort. Kyoshi likes to be petted and rubbed (especially on his chest) but he definitely prefers running and playing to anything that requires sitting still. PS: We have scheduled the next Basic Obedience class here at the Fort. Check out the Training section of our website for more details! Our last (but not least :) assessment this week was Murphy. 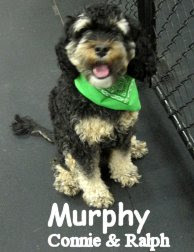 Murphy is a handsome, brown and black, 23 pound, almost two year old Cockapoo. He's the type of dog you just want to pickup, cuddle and never let go of (although we don't recommend too much of that ;). He did ok for his first day, didn't play, but we assume he will soon. 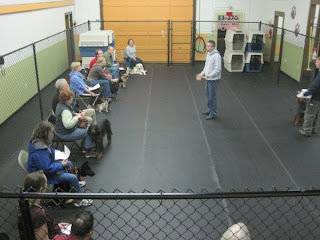 A few months back, Murphy participated in a group training class at the fort. 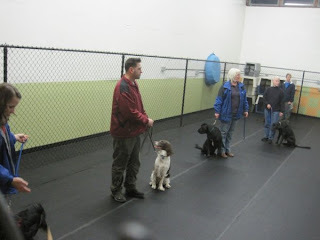 During the off-leash/socialization portion of class Murphy really enjoyed himself with the other pups. That's a great sign, we hope to see him having a barrel of fun in the Medium Roll soon. P.S. Bandit and Shelby came back today! Guess who busted out? Bandit! He cut a rug with Bruiser and a few others in the Medium Roll. Good stuff, he must be feeling comfortable, Shelby should follow his lead in time. Bandit & Shelby experienced their first Fort Fido visit this morning. 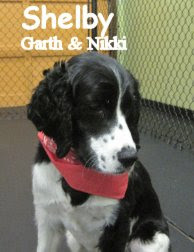 They are two very striking, black and white, English Springer Spaniel siblings. 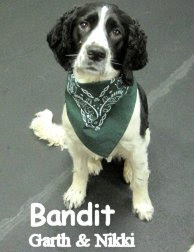 Bandit is the more outgoing one in the duo, he has a long tail (most Springers have docked tails) and seems very alert, ready for action! Shelby is more low key, she has a very calm/quiet disposition and no tail... But sweet none the less lol. Our assessment this morning was Toby and he did very well. He is a one year old, 65 pound, brindle, Shar-Pei/Mastiff/Boxer/who knows mix lol. 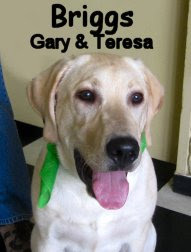 Although high energy, he is a good looking animal, has been to daycare before and speaks darn good "Dog". We here at the fort believe Toby is a 50/50 mix of Shar-Pei and Boxer. The Shar-Pei is definite, very obvious in the face. The boxer, on the other hand, stands out in Toby's play style. The Boxer breed is known for it's unique play style. It uses an upright stance while frequently batting with it's paws (quite like a human boxer). P.S. Here is an article with more info on the situation. 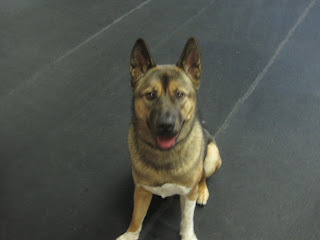 Duke came into his first Fort Fido day ready to rock. He is a three month old Rottweiler/lab mix. Most large breed pups start in the Medium Roll. Duke on the other hand, is one of those young dogs that is a hard player. He needs to learn a thing or two from the pack, some "dog language" or manners so to speak. Due to his very physical play style, Duke was the perfect candidate to get with the big dogs early on. The larger, more mature dogs do not take any guff from youngins. They will play well with a puppy but won't cut it any slack, firm and precise corrections are the norm. After awhile with his elders a young puppy will usually have better bite control and an understanding of fair play. This is a clip of Duke rough housing with Jake... Before his venture into the Big Roll. Here are a couple of movie clips from today! Bruiser the Schipperke scooped up the ball and had a blast being chased by all the big guys. He can definitely run with the big dogs! Bruiser has got a Schipperke's typical high energy, self-confidence, and mischievousness. Once Louis the Olde English Bulldogge got hold of the ball, he couldn't resist taking some victory laps, either! Finn the Yellow Lab also took a turn with the ball, but his pace was a little slower once he had scooped it up. PS-- There is another training seminar scheduled for March 14th. Garrett Stevens will talk about (and demonstrate!) the differences between Dog Training and Dog Whispering. Bring your wild, rambunctious, or strong-willed dog and learn about how dog's think, and how we can communicate with them more effectively. You can always go to the Fort Fido main page and click on the "Training" tab to get up-to-date info on the classes and seminars coming up. I got a kick out of this article today. It is about Opee the off-roading adventure dog. Amazing stuff here, he's even raced in the grueling Baja 500! Opee is a Blue Merle Australian Shepherd, you can checkout his rad website right here. P.S. If you are interested, this link goes to a page that talks all about Dachshund colors, patterns and Coat types. It is very informative and has pictures. 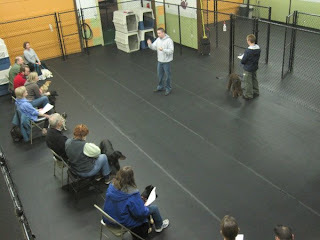 The Basic Obedience and Leadership training class kicked off last night at the fort. We had a nice mix of 10 dogs, their owners and guests. Dad (Dave) snagged a few shots while our trainer Garrett Stevens did his thing. Everyone was soaking up the information like sponges lol. Way to go! I hope to get some graduation shots going after class is over in a couple of weeks. Hank's dad Lynn brought me in this funny Dog Haiku he found in The Bradford Camp's "Munsungan Muse". Paperboy come to kill us all! Mailman-fiend come to kill us all! Meter reader come to kill us all! Garbage man come to kill us all! Neighbor's cat come to kill us all! Scored an awesome clip of Lulu the Golden Retriever rolling around with Cooper the Black Labrador mix in the Medium Roll. Take a look! P.S. Also found a good heart warmer here. Have you ever noticed that when something happens that would be great to film, it's completely done by the time you whip out the camera? I ran into this time and again today! Here's a clip of Leo the Goldendoodle, Sarah the Labrador, and Samba the Samoyed slowing down just after a rousing romp. Chanel, a Wirehaired Dachshund, died today at the ripe old age of 21. She was the world's oldest dog according to Guinness World Records. What a wonderful and long life! You can read more about it here. In other news, there has been a Merrick Dog Treat recall, check it out. It's a fairly popular brand so I thought I'd help spread the word. Yuck! Hank has been coming to Fort Fido pretty much everyday for a couple of years now. He is a great dog and has the Big Roll down pat. It's not his first day at the Rodeo! 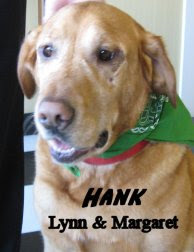 Hank is a 85 pound, seven year old, Golden Retriever / Lab mix. An old soul, Hanky's play is hit and miss. He spends most of his Fido time playing "Dutie" or "Hall Monitor" lol. When he does decide to go for it, he'll take on any young whipper snapper. In this clip, Briggs (a young Yellow Lab) made the old man come alive, we were lucky enough to capture the moment. Good times! Evy, the Kumpi president, sent me this one and it's too funny! Watch out, don't step on him! Hehe. P.S. Here is the info link for the Shar-Pei. Keera is a two year old, 55 pound, black/grey/white, mixed breed. She is having a good time on her first day at the fort. We are still feeling Keera out but believe she can be a good addition to the medium pack. 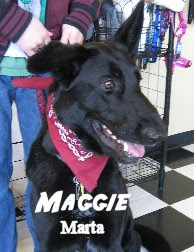 You can see her and Sofie (a mixed breed, Fido regular) bust a little jig in the snippet below. The Fort welcomed two new recruits this morning and Jake was up first. He is an itty-bitty, three month old, German Shepherd who shall soon be a giant! Jake has these massive paws to grow into (the biggest I've seen on a pup in quite some time). He did decent in the Medium Roll, we can't wait for him to find his groove. 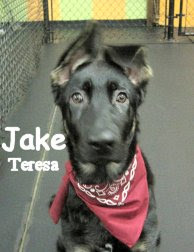 In a few months, Jake will probably start hanging out with his Auntie Maggie (an all black German Shepherd, a Fort Fido regular) in the Big Roll. After Jake strolled in, Abby stopped by. 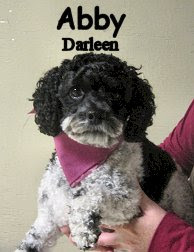 She is a beautiful little, three year old, Cockapoo. She has had a rough start (been attacked multiple times by large dogs) with dog socialization. We at the fort think Abby's day was not too shabby. She seemed to enjoy herself in the Little Roll despite some unfortunate situations in her past. Only time will tell. Word on the street is that she loves ball time... We love ball time too, it can be a great tool to get pets comfortable with doggie daycare. P.S. A couple cool articles here and here! A victory for dog lovers! I stumbled across an interesting article today, which gave me more hope for the future of protecting dogs' rights through legislation. There are now stricter laws in Washington regarding the treatment of dogs in breeding facilities, and the number of breeding animals that one person can own. This should lead to healthier pups and parents, and perhaps to a more caring "dog industry." As with all legislation, it could be better or more complete, but it is a great start. Take a peek at this morning's action! Sarah the Black Lab and Oskar the Doberman Pinscher were tearing it up! PS-- If you're interested in dog-related events, you should check out the CityDog Magazine Event Calendar! Today I thought I'd take a moment to plug Red Dingo Pet Products. Red Dingo has a wonderful line of products. 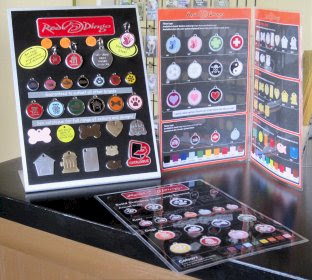 Many of our customers and staff members love their pet ID tags (Especially the stainless steel w/ enamel ones!). The tags are of the highest quality we've seen. They beat the heck out of those tags you can make with the coin operated vending machines. Red Dingo has a wide variety of designs and colors to suit your style. I personally like the durability of the tags, they stay looking new for quite some time. If you haven't, checkout our display in the lobby and Red Dingo's product catalog. Here we have a great clip of Murphy the Golden retriever playing hard with Bear the Newfoundland mix, they had a fun day! P.S. That darn King County Humane Society is overflowing! Read about it here. Cute little Baccardi, the young chocolate Cocker Spaniel, graduated from the Little Roll to the Medium Roll today... She can have more fun this way and did, check it out! When a dog is stressed or overexcited, he or she will often use calming signals to relax. Calming signals can include a variety of different behaviors including yawning, purposeless scratching, lip-licking, and up to thirty other behaviors! When a dog uses a calming signal with another dog, it will often be repeated back--that is why you sometimes see dogs yawning at each other, which just looks silly to us. Here is a video of Louis the Olde English Bulldog giving some calming signals when Walter the Standard Poodle gets too near his sleeping-spot. A time when owners are likely to see calming signals is during training. The important thing to remember is that your dog is trying their best to do what you ask, but their energy is just a little to high at the moment. Turning away from you is probably not an intended slight, but the dog trying to calm itself by looking away. Firm face-to-face meetings, while expected from people, are rude or frightening for dogs. Being patient and firm, without seeming aggressive or getting angry, is the key to getting the behaviors you want from your dog. Calming signals can also work if you give them to your dog-- if Fido is getting a little rambunctious, try yawning at him, he just may yawn back! If you're interested in learning more, you can read an article about calming signals here or watch a video here. And just for fun, here's a clip of some of today's action! Mimi the Chocolate Lab gives Walter quite a spin!